It had only been six months since Stick Insect’s last Listener, the wonderful Godly Mix-up where the grid spelt out PI IS 3 POINT 14159…20900 TO 80 PLACES. I wondered what he had in store for us this week, perhaps ZERO IS 0 POINT 00000…00000 TO 146 PLACES. That seemed unlikely. I started this early in the evening on Saturday, the day of publication. I had promised JEG that I would try and post my entries well ahead of the closing date; I had been running very late with all my crossword activities over the two months leading up to Christmas. 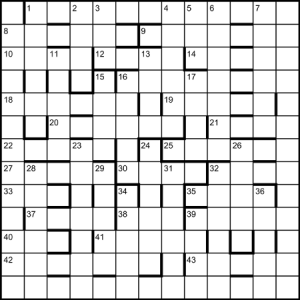 In this week’s puzzle, the perimeter would spell out a message, and its unchecked squares would be provided by the extra wordplay letters in 18 clues… how thoughtful. I started on the acrosses. 8 passed me by, but 9 REMANET, 10 MUDS, 14 ETTLE and 16 SINCLAIR gave me a head start on the top right corner. 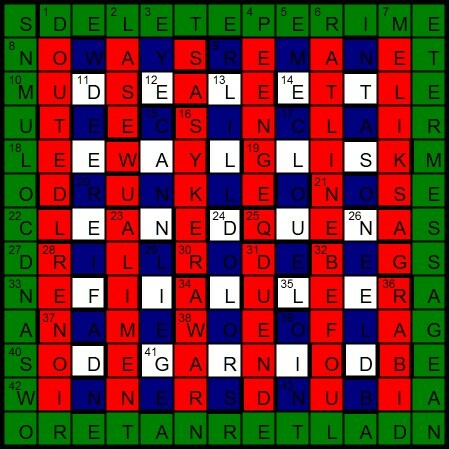 It seemed perverse not to try the corresponding down clues, and 4 PEENGE, 5 EME, 6 RATLNE and 7 MELIKS proved that to be a wise move. So far, I had four extra letters, all vowels… perhaps they all would be. I dropped down the right hand side of the grid. The lack of any clueing for the right-hand column didn’t seem to be a hindrance, and as I turned the corner and tackled the bottom of the grid, the lack of clueing for the bottom row didn’t hold me up either. This was proving remarkable easy. It wasn’t long before I had made a complete circuit of the grid, and with just a few clues to tidy up, it was done in under an hour. Did this mean the endgame would be tricky? The unchecked letters weren’t all to be vowels as I had initially surmised. However, they were all in the correct order going clockwise, and it was only a few seconds until the message was to be seen: DELETE PERIMETER MESSAGE AND ALTERNATE ROWS AND COLUMNS. I mentally deleted the perimeter and rows and columns 2, 4, 6, etc. OASEAE TESNLI DUKENS and more rubbish seemed to be a strange instruction that we were told would appear. I mentally reinstated the rows and columns, and deleted those numbered 3, 5, 7, etc. I was much happier with DELETE ALL, SEND UNFILLED GRID, and mentally deleted those words as well. I suppose that explains why the clues were pretty straightforward. Spending 10 hours solving a puzzle, only to rub it all out again might be considered perverse. So thanks to Stick Insect for providing a fun puzzle, and then taking it away again. What an easy week for JEG! Dilemma: what shall I use as my illustration. I usually start with the submission grid but that was a rather horrid unsymmetrical grid with a double unch in the very first row, so I’d be ashamed to use that. (Actually that was a very fine hint that something unusual was going to happen as the endgame – as it did, to our great glee). I wonder if the editors have decided that Mr Green had at last earned a holiday. I don’t think he is going to have to pore over lots of mis-spelled grids this week. I did the usual Numpty scan to confirm that Stick Insect has renewed his membership of the Listener Oenophile club and, of course, he is a stalwart member, even if there are ‘Pains in North Carolina: end of alcohol in houses (6)’ (alcoho)L in DOORS giving DOLORS). We find ‘Ales brewed to be suitable for light use (4)’ (Ales* = LASE) and ‘Remain liberal about Scots drunk in soil (6)’ (FOU in BE L(iberal) = BEFOUL) so all is well. 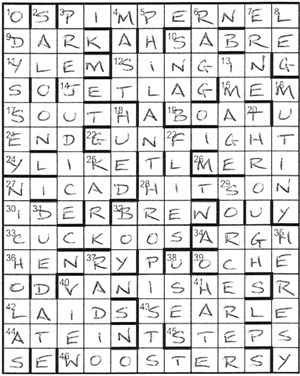 The rest of our solve goes just as quickly as those boozy clues and within an hour, we have a complete grid. This, of course, is because of some lucky guessing with those extra letters. PERIMETER MESSAGE appeared first, and was soon complemented by AND ALTERNATE ROWS AND COLUMNS. Finally, the word DELETE appeared and we chortled with glee. Making a fine little tartan grid of all those columns and rows I have to delete leaves me with the message DELETE ALL: SEND UNFILLED GRID. I laugh with amused reminiscence as the very first crossword the Rasputin team compiled as a group (compiled long before our first joint Listener crossword) was an entertaining thing about cricket, where solvers were invited to ‘burn the grid and send the ashes!’ The late-lamented Radix advised us that the requirement could be rather a suspicious and smelly affair and he suggested that our hidden message should read ‘Only joking: submit as normal!’ That was what finally appeared in the Sunday Telegraph Enigmatic Variations series. Indeed, I was alerted to the fact that there might be a second, contradictory instruction here too, but it seemed not, so an empty grid it is (what a waste of a postage stamp!) but thanks all the same, Stick Insect, for a bit of fun which will, I hope, encourage a few more people to enjoy the weekly Listener as we do. The first Listener of 2015, and it’s a puzzle from my favourite quirky setter, Waterloo. His last, no. 4254 Political Correctness Gone Mad had entries like redaughterant instead of resonant and auntared for uncleared! Those of you with longer memories will no doubt recall OO! Spectacles? back in 2005! This week, Waterloo must have been to the theatre to see Sheridan’s The Rivals as we had a puzzle based on the musings of Mrs Malaprop. 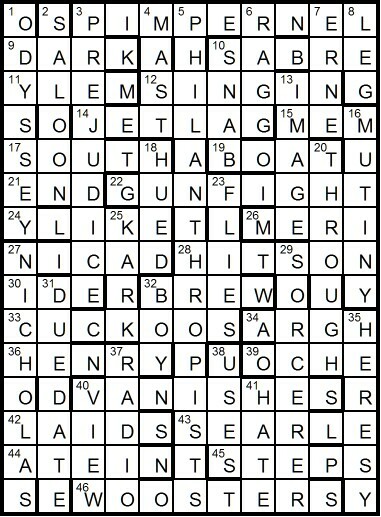 Out of 51 clues, 22 were based on her “misread, misheard or otherwise distorted titles” of books, plays and films. I play golf with someone who, intentionally or not, comes out with such annoying plays on words, so I felt at home here. I just hoped that none would be as tricky as the example given by the title of the puzzle (which probably had Shirley feeling even more at home). A dozen acrosses and half-a-dozen downs had me off to a less than encouraging start, none of them being thematic titles. Bizarrely, we were given the number of letters and number of words in the wrong title, plus the number of letters in the entry. The down entries that I did solve enabled me to see SINGIN’ at 12ac, with Sinnin’ in the Rain being the first themed title. This gave me IL, H and S in 5dn’s Shabby hobbyists (30;3;15) and PHILATELISTS seemed a good guess, but it needed some googling to find Ragged-trousered as the Philanthropists in Robert Tressell’s novel. I hoped that the other titles wouldn’t be as obscure. 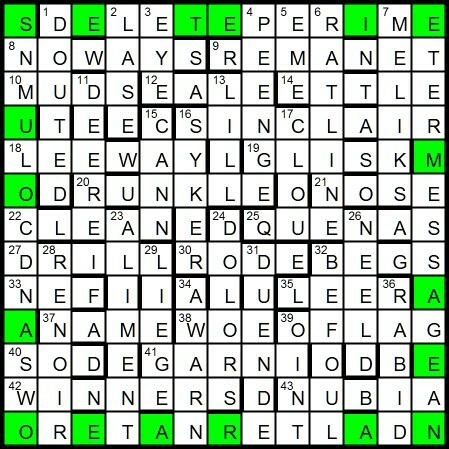 For me, the trickiest was 38dn Why it is not worth learning to read (24;4;4). The entry was obviously USES, but The Uselessness of Literacy by Richard Hoggart took some researching! Anyway, great fun as always from Waterloo, and a gentle introduction to 2015. First of the year, and I didn’t have to read far down to justify Waterloo’s membership of the Listener Setters’ imbibers club – an alcoholic baseball player indeed! Waterloo’s alcohol-inspired clues continued with ‘Wound string around bottles, initially, with unfinished wine (5)’ (S[tring] A[round] + B[ottles] + RE[d], giving SABRE) a bit of a clunky clue, but generous to the solver, as I feel the first of the year should be, especially after the difficult ones we have just struggled with. The preamble, also, raised a Numpty smile as there was a catcher high on rye – I doubt such a drunkard would last long in a US baseball team, but we laughed at the device. We continued to laugh as solutions revealed themselves. Some of the misunderstanding of this modern Mrs Malaprop were hilarious. We particularly enjoyed ‘Three Men in a Boot’ (A journey in an overfilled car), ‘Lord of the Files’ (The boss in the office) and ‘Knickerless Nickleby’ (A naturist at large). Our complete list of malapropisms was: The Scarlet Pimple, His Stark Materials, Sinning in the Rain, North and Southey, Three Men in a Boot, The Den of the Affair, Bunfight at the OK Corral, The Midwich Cuckolds, Horrid Henley, The Lady Varnishes, The Thirty-nine Stops, The Code of the Worcesters, The Oddity, Pride and Perjuries, The Ragged-Trousered Philatelists, Immunity on the Bounty, Threw the Looking-Glass, Lord of the Files, Knickerless Nickleby, A Suitable Buy, The Uselessness of Literacy, and A Few from the Bridge. The word-counts of these misunderstandings were a great help: we might have had a lot more trouble had it not been for those. This set of comical malapropisms provided a speedy and amusing Numpty solve with just the odd final doubt. 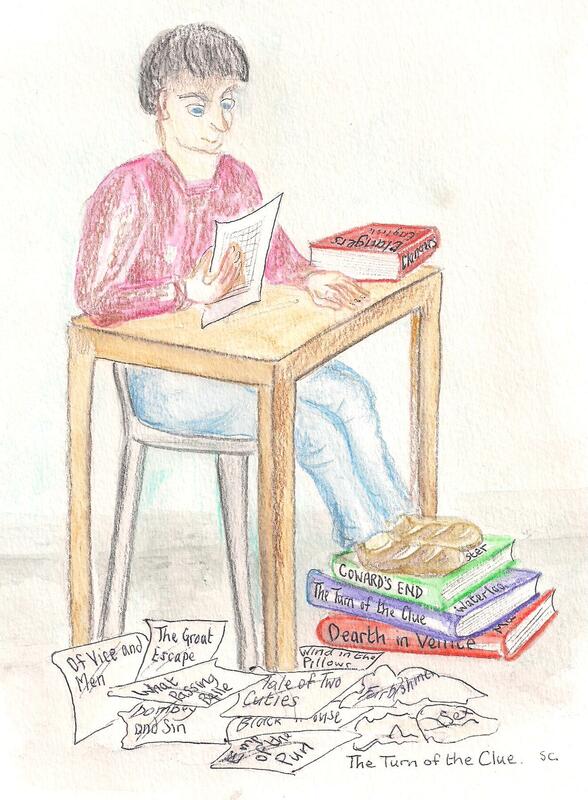 That 4d clue had us scratching our heads: ‘Upright author appears from poem reading this (4)’. We had M?ST so clearly our answer was MAST (upright) but it took us a while to solve the wordplay. We had to read M ‘as’ T (poeT being switched for poeM, to produce our solution). This was a step up in difficulty from the rest of the clues but that was fair enough as there couldn’t be much doubt about the definition. 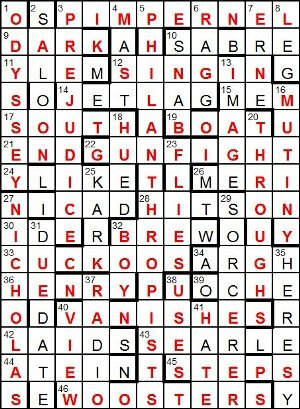 I thoroughly enjoyed this bit of fun and noticed, from comments on the Answerbank and comments that reached me later from fellow solvers, that a number of lady partners and relations of solvers thought this was great fun, while the men seemed to grumble, finding the titles obscure in some cases. When I remarked to the other Numpty that literature was perhaps a more feminine theme than some of the usual Listener ones, as we are perhaps the ones who read widely, while the men pride themselves on working out base 24 or (mis)understanding about the coincidence of clock hands, he accused me of stereotyping and claimed that he thought this one was ‘really good – different and much more fun than most’. 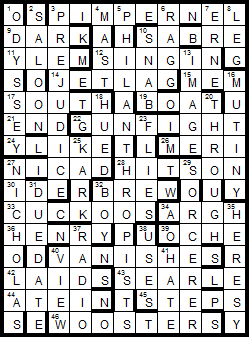 Stereotyping or not, the truth is that we don’t see much poetry or literature in our Listener crosswords, so ‘Thank you, Waterloo’ for that romp.